It’s not every day in Palm Coast that you meet someone who has proudly crowned himself the purveyor of good times, who also, incongruously, is a former detention officer. When a 24-year-old Mark Woods first came to Flagler Beach to visit his parents in 1996, it was just supposed to be a temporary hiatus from his “mentally taxing” job in youth corrections in land-locked Missouri. Woods was admittedly feeling some “dissonance” in his mind. Something wasn’t right. His mother, who moved here while he was in college, “In her wisdom, said, ‘You should hang out here for a little bit, get your stuff straightened out,’” he recalled. “I was really into Jimmy Buffett at the time,” Woods said of the famous singer who built an empire on ballads about easy-going introspection and re-jiggered priorities. Credit who you will, 21 years later, Woods is a very different person, with a colorful, yet incongruous TikiTender alias to boot. He can’t remember who initially bestowed the moniker upon him, but the observation was borne from an irrepressible joy Woods exhibited while tending bar in Tiki-themed settings—a good indication of his true feelings about his former occupation. While today his clothes are now more distinctly of the vintage variety (when he’s not decked out in Chicago Cubs gear) than that of a Tribal chieftain, Woods is still indisputably one of the more piquant personalities roaming our entrepreneur ecosystem. Mark’s business is Fun Coast Bartending—a full-service company that provides event bartenders spanning Northeast Florida, which he started in May, 2012. He’s also a certified responsible vendor trainer. Woods was actually Entrepreneur Night’s June 2012 Entrepreneur of the Month back when we had patch of time naming an entrepreneur for each month. It was a boon for business for Mark, because, simply, it created a lot of awareness so much so a newspaper published an article about him. Plus entrepreneurs like helping other entrepreneurs. But first, came years of working up the ranks as a “lowly” bartender first at the Harborside Inn, the most happening city landmark hotel in Palm Coast during the City’s early years, and then, most notably, at the popular, beachside Golden Lion Cafe, before he was ready to make a go of it. At the Lion, Woods said he became something of a lion himself. He did this with makeshift Tiki-cocktails and his own made up holidays. The funny thing is that when Woods first arrived, plan-less, bartending to him just wasn’t a real job, even though his already proven wise mother thought differently. “She said you’ve got the personality for it,” he remembered. So instead he drove rich people around in golf carts for a while—clearing his head. It would be four years before Woods “picked up the shaker for the first time.” A couple of classic refrains from the classic Buffett song Margaritaville of “looking for my lost shaker of salt” and “How I got here, I haven’t got a clue,” come to mind. Before getting there, he went looking for a banquet job instead, one that would give him the flexibility to return to school to become a high school teacher. But the Harborside manager at the now non-existent locale serendipitously offered him a bartending gig instead, even though he had no experience, offering up the same, simple justification as his mother. “I’d never even waited tables,” Woods said. But he shrugged and accepted the offer. Woods managed to leverage his Buffett fandom to grow his following beyond Florida, calling out into the virtual ocean of Buffett fans, or “Parrotheads” as they’re called, via the Berea, Ohio-based Island Time Radio from the upper deck of the Lion every few weeks. Woods called it the Flagler Beach report from A1A. “A1A is very significant in Buffett’s world,” Woods explained. Fans from all over the country would drive to the Lion, seeking out Woods and some of his specialty drinks. The Pango rhum Tiki-Cooler, for example. One of the means by which Woods helped push his business, in fact, was building it around his personal Tiki-brand—a good takeaway for our readers. He became one of Flagler County’s best examples of being a Social Media influencer, billing himself on Twitter and Facebook as “the purveyor of good times.” To most peering eyes, he has validated the epithet with curious, suggestive material. 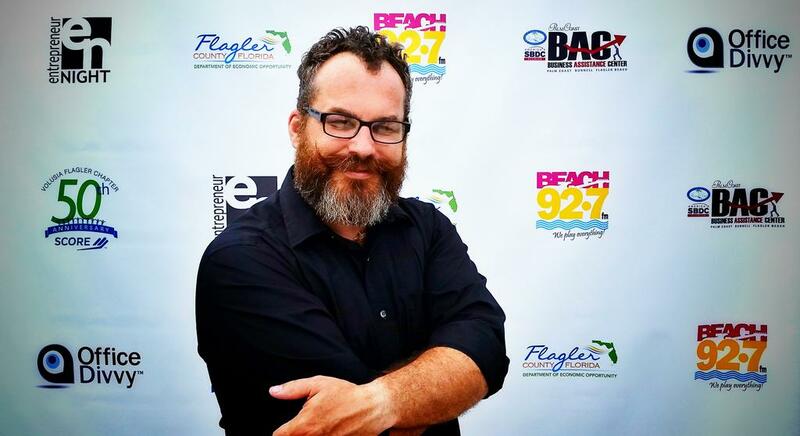 Today, in addition to his main business, Funcoast Bartending, Woods is also a DJ on Surf 97.3, the local Flagler Beach Radio Station, with two late night shows a week called Ride the Wave. He brings his audience the Caribbean sounds of Soca, Calypso, Ska, Blue-Beat, and Reggae varietals. You can also catch Woods few nights of the week at the Humidor Cigar Bar and Lounge in European Village, where he is a managing partner. He recommends the ChupaCabra Hellcat cigar paired with the Buried Hatchet Imperial stout or maybe just a shot Ristretto espresso. Mark “Tikitender” Woods’ Funcoast Bartending provides event bartending services in up to 150 events a year. These vary from private birthday and poolside parties to large events for corporate organizations such as the Chamber of Commerce and City of Palm Coast. Mark is absolutely one of the most interesting and true entrepreneurs with so much dimension who lives and operates his business in our area! He’s a great business partner (at our company The Humidor Cigar Bar), and he also handled a lot of successful events for my company at Office Divvy. God speed friend! I went to high school with Mark who would have interesting parties in high school and college! This article of his success does not surprise me in the least! He has always been the life of the party!